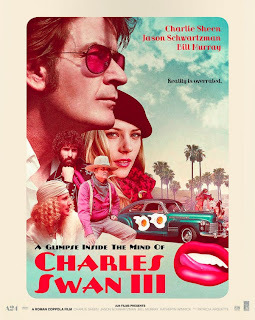 I haven't seen A Glimpse Inside The Mind Of Charles Swan III but the trailer left me so flabbergasted I had to share it with you. I think we all need to go see this one in the theatre. It will completely screw with studio executives minds if it does huge box office. Also I want to join the secret society of ball busters. Finally, I'm really rooting for Charlie Sheen, he's a local kid like Robert Downey, and I'd love to see him become just as successful again. Can you tell I love an under dog?? It begins a limited theatrical release this Friday February 8th. I hadn't even heard of this, thanks for the heads up. It looks bizarre, interesting, and possibly very funny. My sentiments exactly. It's getting mixed reviews but these kind of films just aren't for everybody. Glad you're up for it!